"This is a great appetizer with a delicious sweet and tangy flavor." Stir the water chestnuts together with the garlic powder and soy sauce in a small bowl. Set aside to marinate for 30 minutes. Drain the water chestnuts, discarding the soy sauce. 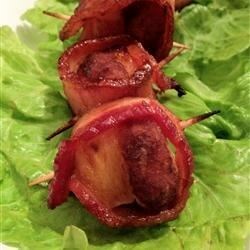 Place a pineapple chunk in the center of each piece of bacon, then place a water chestnut on top of that. Fold the ends of the bacon over the water chestnut, and secure with a toothpick. Repeat with the remaining bacon, pineapple, and water chestnuts. Gently toss the bacon-wrapped chestnuts with brown sugar in a bowl, then place onto the prepared baking sheet. Bake in the preheated oven for 25 minutes, then turn the pieces over, and continue baking 15 to 35 minutes longer until the bacon has cooked to your desired degree of doneness. Briefly drain on a paper towel-lined plate, and serve hot. Great twist on an old recipe! Anytime I make these, they don't last very long. No need for changes on this one.